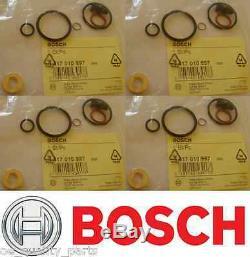 SET OF 4 ORIGINAL GENUINE BOSCH DIESEL INJECTOR SEAL REPAIR KITS. BOSCH PART NUMBER: 1417010997 IS A REPLACEMENT FOR OE NUMBER: 038198051B. MODEL / ENGINE TYPE - CODE / POWER kW - HP / YEARS. AUDI A3 (8L1) 1.9 TDI ASZ 96 (130) 1896 2000.08. AUDI A3 (8L1) 1.9 TDI ATD, AXR 74 (100) 1896 2000.10. AUDI A3 (8L1) 1.9 TDI quattro ASZ 96 (130) 1896 2000.08. AUDI A3 (8P1) 1.9 TDI BKC, BLS, BXE 77 (105) 1896 2003.05. AUDI A3 (8P1) 2.0 TDI BMM 103 (140) 1968 2005.06. AUDI A3 (8P1) 2.0 TDI quattro BMM 103 (140) 1968 2006.01. AUDI A3 kabriolet 1.9 TDI BLS 77 (105) 1896 2008.04. AUDI A3 Sportback (8PA) 1.9 TDI BKC, BLS, BXE 77 (105) 1896 2004.09. AUDI A3 Sportback (8PA) 2.0 TDI BMM 103 (140) 1968 2005.06. AUDI A3 Sportback (8PA) 2.0 TDI quattro BMM 103 (140) 1968 2006.01. AUDI A4 (8D2, B5) 1.9 TDI AJM 85 (116) 1896 2000.03 - 2000.11. AUDI A4 (8D2, B5) 1.9 TDI quattro AJM, ATJ 85 (116) 1896 2000.03 - 2000.11. AUDI A4 (8E2, B6) 1.9 TDI AVF, AWX 96 (130) 1896 2000.11 - 2004.12. AUDI A4 (8E2, B6) 1.9 TDI AVB 74 (101) 1896 2001.05 - 2004.12. AUDI A4 (8E2, B6) 1.9 TDI BKE 85 (116) 1896 2004.06 - 2004.12. AUDI A4 (8E2, B6) 1.9 TDI quattro AVF 96 (130) 1896 2001.11 - 2004.12. AUDI A4 (8EC, B7) 1.9 TDI BKE, BRB 85 (116) 1896 2004.11 - 2008.06. AUDI A4 (8EC, B7) 2.0 TDI BPW 103 (140) 1968 2004.11 - 2008.06. AUDI A4 (8EC, B7) 2.0 TDI quattro BPW 103 (140) 1968 2006.01 - 2008.06. AUDI A4 Avant (8D5, B5) 1.9 TDI AJM 85 (115) 1896 2000.03 - 2001.09. AUDI A4 Avant (8D5, B5) 1.9 TDI quattro AJM, ATJ 85 (115) 1896 2000.03 - 2001.09. AUDI A4 Avant (8E5, B6) 1.9 TDI AVF, AWX 96 (130) 1896 2001.09 - 2004.12. AUDI A4 Avant (8E5, B6) 1.9 TDI AVB 74 (101) 1896 2001.11 - 2004.12. AUDI A4 Avant (8E5, B6) 1.9 TDI BKE 85 (116) 1896 2004.06 - 2004.12. AUDI A4 Avant (8E5, B6) 1.9 TDI quattro AVF 96 (130) 1896 2001.11 - 2004.12. AUDI A4 Avant (8ED, B7) 1.9 TDI BKE, BRB 85 (116) 1896 2004.11 - 2008.06. AUDI A4 Avant (8ED, B7) 2.0 TDI BPW 103 (140) 1968 2004.11 - 2008.06. AUDI A4 Avant (8ED, B7) 2.0 TDI quattro BPW 103 (140) 1968 2006.01 - 2008.06. AUDI A4 kabriolet (8H7, B6, 8HE, B7) 2.0 TDI BPW 103 (140) 1968 2006.01 - 2009.03. AUDI A4 kabriolet (8H7, B6, 8HE, B7) 2.0 TDI BRC 100 (136) 1968 2006.01 - 2009.03. AUDI A6 (4B, C5) 1.9 TDI AJM 85 (115) 1896 2000.07 - 2005.01. AUDI A6 (4B, C5) 1.9 TDI AVF, AWX 96 (130) 1896 2001.08 - 2005.01. AUDI A6 Avant (4B, C5) 1.9 TDI AJM 85 (115) 1896 2000.07 - 2005.01. AUDI A6 Avant (4B, C5) 1.9 TDI AVF, AWX 96 (130) 1896 2001.08 - 2005.01. FORD GALAXY (WGR) 1.9 TDI AHU, 1Z, ANU 66 (90) 1896 1995.03 - 2006.05. FORD GALAXY (WGR) 1.9 TDI AUY 85 (115) 1896 2000.04 - 2006.05. FORD GALAXY (WGR) 1.9 TDI ASZ 96 (130) 1896 2003.02 - 2006.05. FORD GALAXY (WGR) 1.9 TDI BTB 110 (150) 1896 2005.05 - 2006.05. SEAT ALHAMBRA (7V8, 7V9) 1.9 TDI 1Z, AHU, ANU 66 (90) 1896 1996.04 - 2010.03. SEAT ALHAMBRA (7V8, 7V9) 1.9 TDI AUY, BVK 85 (115) 1896 2000.06 - 2010.03. SEAT ALHAMBRA (7V8, 7V9) 1.9 TDI ASZ 96 (131) 1896 2002.11 - 2008.11. SEAT ALHAMBRA (7V8, 7V9) 1.9 TDI ARL, BTB 110 (150) 1896 2005.05 - 2007.05. SEAT ALHAMBRA (7V8, 7V9) 1.9 TDI 4motion AUY, BVK 85 (115) 1896 2000.06 - 2010.03. SEAT ALHAMBRA (7V8, 7V9) 2.0 TDI BRT 103 (140) 1968 2005.11 - 2010.03. SEAT ALTEA (5P1) 1.9 TDI BKC, BJB, BLS, BXE 77 (105) 1896 2004.04. SEAT ALTEA (5P1) 2.0 TDI BMM 103 (140) 1968 2005.11. SEAT ALTEA XL (5P5, 5P8) 1.9 TDI BLS, BXE 77 (105) 1896 2006.10. SEAT ALTEA XL (5P5, 5P8) 2.0 TDI BMM 103 (140) 1968 2006.10. SEAT ALTEA XL (5P5, 5P8) 2.0 TDI 4x4 BMM 103 (140) 1968 2007.06. SEAT CORDOBA (6L2) 1.9 TDI ASZ, BLT 96 (131) 1896 2002.10 - 2009.11. SEAT CORDOBA (6L2) 1.9 TDI ATD, AXR, BMT 74 (100) 1896 2002.09 - 2009.11. SEAT IBIZA IV (6L1) 1.9 TDI ATD, AXR, BMT 74 (100) 1896 2002.02 - 2009.11. SEAT IBIZA IV (6L1) 1.9 TDI ASZ, BLT 96 (131) 1896 2002.02 - 2009.11. SEAT IBIZA IV (6L1) 1.9 TDI Cupra R BPX, BUK 118 (160) 1896 2004.03 - 2008.02. SEAT IBIZA V (6J5) 1.9 TDI BXJ 66 (90) 1896 2008.07. SEAT IBIZA V SPORTCOUPE (6J1) 1.9 TDI BXJ 66 (90) 1896 2008.07. SEAT IBIZA V SPORTCOUPE (6J1) 1.9 TDI BLS 77 (105) 1896 2008.07. SEAT LEON (1M1) 1.9 TDI ARL 110 (150) 1896 2001.02 - 2006.06. SEAT LEON (1M1) 1.9 TDI ASZ 96 (130) 1896 2003.05 - 2006.06. SEAT LEON (1M1) 1.9 TDI AXR 74 (100) 1896 2005.10 - 2006.06. SEAT LEON (1M1) 1.9 TDI Syncro ARL 110 (150) 1896 2002.05 - 2006.06. SEAT LEON (1P1) 1.9 TDI BKC, BLS, BXE 77 (105) 1896 2005.07. SEAT LEON (1P1) 2.0 TDI BMM 103 (140) 1968 2005.10. SEAT TOLEDO II (1M2) 1.9 TDI ARL 110 (150) 1896 2000.10 - 2006.05. SEAT TOLEDO II (1M2) 1.9 TDI ASZ 96 (130) 1896 2003.05 - 2006.05. SEAT TOLEDO III (5P2) 1.9 TDI BKC, BJB, BLS, BXE 77 (105) 1896 2004.10 - 2009.05. SEAT TOLEDO III (5P2) 2.0 TDI BMM 103 (140) 1968 2005.11 - 2009.05. SKODA FABIA 1.9 TDI BLS, BSW 77 (105) 1896 2007.04. SKODA FABIA (6Y2) 1.9 TDI ATD, AXR 74 (100) 1896 2000.01 - 2008.03. SKODA FABIA (6Y2) 1.9 TDI RS ASZ, BLT 96 (130) 1896 2003.06 - 2008.03. SKODA FABIA Combi 1.9 TDI BLS, BSW 77 (105) 1896 2007.10. SKODA FABIA Combi (6Y5) 1.9 TDI ATD, AXR 74 (100) 1896 2000.04 - 2007.12. SKODA FABIA sedan (6Y3) 1.9 TDI ATD, AXR 74 (100) 1896 2000.01 - 2007.12. SKODA OCTAVIA (1U2) 1.9 TDI ASZ 96 (130) 1896 2003.01. SKODA OCTAVIA (1U2) 1.9 TDI AXR 74 (100) 1896 2005.10. SKODA OCTAVIA (1Z3) 1.9 TDI BKC, BJB, BLS, BXE 77 (105) 1896 2004.06 - 2010.12. SKODA OCTAVIA (1Z3) 2.0 TDI BMM 103 (140) 1968 2005.11. SKODA OCTAVIA Combi (1U5) 1.9 TDI ASZ 96 (130) 1896 2003.01. SKODA OCTAVIA Combi (1U5) 1.9 TDI ATD, AXR 74 (100) 1896 2000.08. SKODA OCTAVIA Combi (1U5) 1.9 TDI 4x4 ATD 74 (100) 1896 2000.09. SKODA OCTAVIA Combi (1Z5) 1.9 TDI BKC, BJB, BLS, BXE 77 (105) 1896 2004.09 - 2010.12. SKODA OCTAVIA Combi (1Z5) 1.9 TDI 4x4 BKC, BLS, BXE 77 (105) 1896 2004.11 - 2010.12. SKODA OCTAVIA Combi (1Z5) 2.0 TDI BMM 103 (140) 1968 2005.11. SKODA OCTAVIA Combi (1Z5) 2.0 TDI 4x4 BMM 103 (140) 1968 2006.07. SKODA ROOMSTER (5J) 1.9 TDI BLS, BSW 77 (105) 1896 2006.09 - 2010.03. SKODA SUPERB (3T4) 1.9 TDI BLS, BXE 77 (105) 1896 2008.03. SKODA SUPERB (3T4) 2.0 TDI BMP 103 (140) 1968 2008.03. SKODA SUPERB (3U4) 1.9 TDI AWX, AVF 96 (130) 1896 2002.02 - 2008.03. SKODA SUPERB (3U4) 1.9 TDI AVB 74 (101) 1896 2002.08 - 2005.10. SKODA SUPERB (3U4) 1.9 TDI BPZ 85 (115) 1896 2007.01 - 2008.03. SKODA SUPERB (3U4) 1.9 TDI BSV 77 (105) 1896 2005.10 - 2007.05. SKODA SUPERB (3U4) 2.0 TDI BSS 103 (140) 1968 2005.10 - 2008.03. SKODA SUPERB kombi (3T5) 1.9 TDI BLS, BXE 77 (105) 1896 2009.10 - 2010.11. SKODA SUPERB kombi (3T5) 2.0 TDI BMP 103 (140) 1968 2009.10 - 2010.03. VW BORA (1J2) 1.9 TDI AJM, AUY 85 (115) 1896 1998.12 - 2001.06. VW BORA (1J2) 1.9 TDI ATD, AXR 74 (101) 1896 2000.09 - 2005.05. VW BORA (1J2) 1.9 TDI ARL 110 (150) 1896 2000.05 - 2005.05. VW BORA (1J2) 1.9 TDI ASZ 96 (130) 1896 2000.11 - 2005.05. VW BORA (1J2) 1.9 TDI 4motion AJM, AUY 85 (115) 1896 1999.02 - 2001.06. VW BORA (1J2) 1.9 TDI 4motion ATD 74 (101) 1896 2000.09 - 2005.05. VW BORA (1J2) 1.9 TDI 4motion ARL 110 (150) 1896 2000.05 - 2005.05. VW BORA (1J2) 1.9 TDI 4motion ASZ 96 (130) 1896 2000.11 - 2005.05. VW BORA kombi (1J6) 1.9 TDI AJM, AUY 85 (115) 1896 1999.05 - 2001.06. VW BORA kombi (1J6) 1.9 TDI ATD, AXR 74 (101) 1896 2000.09 - 2005.05. VW BORA kombi (1J6) 1.9 TDI ASZ 96 (130) 1896 2000.11 - 2005.05. VW BORA kombi (1J6) 1.9 TDI ARL 110 (150) 1896 2001.05 - 2005.05. VW BORA kombi (1J6) 1.9 TDI 4motion AJM, AUY 85 (115) 1896 1999.05 - 2001.06. VW BORA kombi (1J6) 1.9 TDI 4motion ATD 74 (101) 1896 2000.09 - 2005.05. VW BORA kombi (1J6) 1.9 TDI 4motion ASZ 96 (130) 1896 2000.11 - 2005.05. VW BORA kombi (1J6) 1.9 TDI 4motion ARL 110 (150) 1896 2001.05 - 2005.05. VW CADDY III kombi (2KB, 2KJ, 2CB, 2CJ) 1.9 TDI BJB, BLS 77 (105) 1896 2004.04 - 2010.08. VW CADDY III kombi (2KB, 2KJ, 2CB, 2CJ) 1.9 TDI BSU 55 (75) 1896 2005.09 - 2010.08. VW CADDY III kombi (2KB, 2KJ, 2CB, 2CJ) 1.9 TDI 4motion BLS 77 (105) 1896 2008.05 - 2010.08. VW CADDY III kombi (2KB, 2KJ, 2CB, 2CJ) 2.0 SDI BDJ, BST 51 (70) 1968 2004.03 - 2010.08. VW CADDY III kombi (2KB, 2KJ, 2CB, 2CJ) 2.0 TDI BMM 103 (140) 1968 2007.09 - 2010.08. VW CADDY III box (2KA, 2KH, 2CA, 2CH) 1.9 TDI BJB, BLS 77 (105) 1896 2004.04 - 2010.08. VW CADDY III box (2KA, 2KH, 2CA, 2CH) 1.9 TDI BSU 55 (75) 1896 2005.09 - 2010.08. VW CADDY III box (2KA, 2KH, 2CA, 2CH) 1.9 TDI 4motion BLS 77 (105) 1896 2008.11 - 2010.08. VW CADDY III box (2KA, 2KH, 2CA, 2CH) 2.0 SDI BDJ, BST 51 (70) 1968 2004.03 - 2010.08. VW CADDY III box (2KA, 2KH, 2CA, 2CH) 2.0 TDI BMM 103 (140) 1968 2007.09 - 2010.08. VW EOS (1F7, 1F8) 2.0 TDI BMM 103 (140) 1968 2006.06 - 2008.05. VW GOLF IV (1J1) 1.9 TDI AJM, AUY 85 (115) 1896 1998.12 - 2001.06. VW GOLF IV (1J1) 1.9 TDI ATD, AXR 74 (101) 1896 2000.09 - 2005.06. VW GOLF IV (1J1) 1.9 TDI ARL 110 (150) 1896 2000.05 - 2005.06. VW GOLF IV (1J1) 1.9 TDI ASZ 96 (130) 1896 2000.11 - 2005.06. VW GOLF IV (1J1) 1.9 TDI 4motion AJM, AUY 85 (115) 1896 1999.09 - 2001.06. VW GOLF IV (1J1) 1.9 TDI 4motion ATD 74 (101) 1896 2000.09 - 2005.06. VW GOLF IV (1J1) 1.9 TDI 4motion ARL 110 (150) 1896 2000.02 - 2005.06. VW GOLF IV (1J1) 1.9 TDI 4motion ASZ 96 (130) 1896 2000.11 - 2005.06. VW GOLF IV Variant (1J5) 1.9 TDI AJM, AUY 85 (115) 1896 1999.08 - 2001.06. VW GOLF IV Variant (1J5) 1.9 TDI ATD, AXR 74 (101) 1896 2000.09 - 2006.06. VW GOLF IV Variant (1J5) 1.9 TDI ASZ 96 (130) 1896 2000.11 - 2006.06. VW GOLF IV Variant (1J5) 1.9 TDI 4motion AJM 85 (115) 1896 1999.05 - 2001.06. VW GOLF IV Variant (1J5) 1.9 TDI 4motion ATD 74 (101) 1896 2000.09 - 2006.06. VW GOLF IV Variant (1J5) 1.9 TDI 4motion ASZ 96 (130) 1896 2000.11 - 2006.06. VW GOLF PLUS (5M1, 521) 1.9 TDI BKC, BLS, BXE 77 (105) 1896 2005.01 - 2009.01. VW GOLF PLUS (5M1, 521) 1.9 TDI BRU, BXF, BXJ 66 (90) 1896 2005.05 - 2008.12. VW GOLF PLUS (5M1, 521) 2.0 TDI BMM 103 (140) 1968 2005.12 - 2009.05. VW GOLF V (1K1) 1.9 TDI BKC, BLS, BXE 77 (105) 1896 2003.10. VW GOLF V (1K1) 1.9 TDI BRU, BXF, BXJ 66 (90) 1896 2004.05. VW GOLF V (1K1) 1.9 TDI 4motion BKC, BLS, BXE 77 (105) 1896 2004.08. VW GOLF V (1K1) 2.0 TDI BMM 103 (140) 1968 2004.12. VW GOLF V (1K1) 2.0 TDI 4motion BMM 103 (140) 1968 2004.08. VW GOLF V Variant (1K5) 1.9 TDI BLS, BXE 77 (105) 1896 2007.06. VW GOLF V Variant (1K5) 1.9 TDI 4motion BLS 77 (105) 1896 2008.01. VW GOLF V Variant (1K5) 2.0 TDI BMM 103 (140) 1968 2007.06. VW GOLF VI Variant (AJ5) 2.0 TDI BMM 103 (140) 1968 2009.07. VW JETTA III (1K2) 1.9 TDI BKC, BLS, BXE 77 (105) 1896 2005.08 - 2010.10. VW JETTA III (1K2) 2.0 TDI BMM 103 (140) 1968 2005.10 - 2010.10. VW MULTIVAN V (7HM, 7HN, 7HF, 7EF, 7EM, 7EN) 1.9 TDI AXB 77 (105) 1896 2003.04 - 2009.11. VW MULTIVAN V (7HM, 7HN, 7HF, 7EF, 7EM, 7EN) 1.9 TDI BRS 75 (102) 1896 2006.06 - 2009.11. VW MULTIVAN V (7HM, 7HN, 7HF, 7EF, 7EM, 7EN) 1.9 TDI BRR 62 (84) 1896 2006.01 - 2009.11. VW NEW BEETLE (9C1, 1C1) 1.9 TDI ATD, BEW 74 (101) 1896 2001.02. VW NEW BEETLE (9C1, 1C1) 1.9 TDI BSW 77 (105) 1896 2005.07. VW NEW BEETLE kabriolet (1Y7) 1.9 TDI AXR 74 (100) 1896 2003.06. VW NEW BEETLE kabriolet (1Y7) 1.9 TDI BSW 77 (105) 1896 2005.07. VW PASSAT (3B2) 1.9 TDI AJM, ATJ 85 (115) 1896 1998.08 - 2000.11. VW PASSAT (3B2) 1.9 TDI AVB 74 (101) 1896 2000.02 - 2000.11. VW PASSAT (3B2) 1.9 TDI 4motion AJM, ATJ 85 (115) 1896 1999.08 - 2000.11. VW PASSAT (3B3) 1.9 TDI AVB 74 (101) 1896 2000.11 - 2005.05. VW PASSAT (3B3) 1.9 TDI AVF, AWX 96 (130) 1896 2000.11 - 2005.05. VW PASSAT (3B3) 1.9 TDI 4motion AVF 96 (130) 1896 2000.11 - 2005.05. VW PASSAT (3B3) 2.0 TDI BGW 100 (136) 1968 2003.12 - 2005.05. VW PASSAT (3C2) 1.9 TDI BKC, BLS, BXE 77 (105) 1896 2005.03. VW PASSAT (3C2) 2.0 TDI BMP 103 (140) 1968 2005.03. VW PASSAT (3C2) 2.0 TDI 4motion BMP 103 (140) 1968 2005.03. VW PASSAT Variant (3B5) 1.9 TDI AJM, ATJ 85 (115) 1896 1998.08 - 2000.11. VW PASSAT Variant (3B5) 1.9 TDI AVB 74 (101) 1896 2000.02 - 2000.11. VW PASSAT Variant (3B5) 1.9 TDI 4motion ATJ 85 (115) 1896 1999.08 - 2000.11. VW PASSAT Variant (3B6) 1.9 TDI AVB 74 (101) 1896 2000.11 - 2005.05. VW PASSAT Variant (3B6) 1.9 TDI AVF, AWX 96 (130) 1896 2000.11 - 2005.05. VW PASSAT Variant (3B6) 1.9 TDI 4motion AVF 96 (130) 1896 2000.11 - 2005.05. VW PASSAT Variant (3B6) 2.0 TDI BGW 100 (136) 1968 2003.12 - 2005.05. VW PASSAT Variant (3C5) 1.9 TDI BKC, BLS, BXE 77 (105) 1896 2005.08. VW PASSAT Variant (3C5) 2.0 TDI BMP 103 (140) 1968 2005.08. VW PASSAT Variant (3C5) 2.0 TDI 4motion BMP 103 (140) 1968 2005.08. VW POLO (9N_) 1.9 TDI ATD, AXR, BMT 74 (101) 1896 2001.10. VW POLO (9N_) 1.9 TDI ASZ, BLT 96 (130) 1896 2003.11. VW SHARAN (7M8, 7M9, 7M6) 1.9 TDI 1Z, AHU, ANU 66 (90) 1896 1995.09 - 2010.03. VW SHARAN (7M8, 7M9, 7M6) 1.9 TDI AUY, BVK 85 (115) 1896 2000.04 - 2010.03. VW SHARAN (7M8, 7M9, 7M6) 1.9 TDI ASZ 96 (130) 1896 2002.11 - 2010.03. VW SHARAN (7M8, 7M9, 7M6) 1.9 TDI BTB 110 (150) 1896 2005.06 - 2010.03. VW SHARAN (7M8, 7M9, 7M6) 1.9 TDI 4motion AUY, BVK 85 (115) 1896 2000.04 - 2010.03. VW SHARAN (7M8, 7M9, 7M6) 2.0 TDI BVH 100 (136) 1968 2005.11 - 2010.03. VW SHARAN (7M8, 7M9, 7M6) 2.0 TDI BRT 103 (140) 1968 2005.11 - 2010.03. VW TOURAN (1T1, 1T2, 1T3) 1.9 TDI AVQ 74 (100) 1896 2003.02. VW TOURAN (1T1, 1T2, 1T3) 1.9 TDI BKC, BLS, BXE 77 (105) 1896 2003.08 - 2010.05. VW TOURAN (1T1, 1T2, 1T3) 1.9 TDI BRU, BXF, BXJ 66 (90) 1896 2004.11 - 2010.05. VW TOURAN (1T1, 1T2, 1T3) 2.0 TDI BMM 103 (140) 1968 2005.12 - 2010.05. VW TRANSPORTER V Autobus (7HB, 7HJ, 7EB, 7EJ, 7EF) 1.9 TDI AXC 63 (85) 1896 2003.04 - 2009.11. VW TRANSPORTER V Autobus (7HB, 7HJ, 7EB, 7EJ, 7EF) 1.9 TDI AXB 77 (105) 1896 2003.04 - 2009.11. VW TRANSPORTER V Autobus (7HB, 7HJ, 7EB, 7EJ, 7EF) 1.9 TDI BRS 75 (102) 1896 2006.06 - 2009.11. VW TRANSPORTER V Autobus (7HB, 7HJ, 7EB, 7EJ, 7EF) 1.9 TDI BRR 62 (84) 1896 2006.01 - 2009.11. VW TRANSPORTER V box (7HA, 7HH, 7EA, 7EH) 1.9 TDI AXC 63 (85) 1896 2003.04 - 2009.11. VW TRANSPORTER V box (7HA, 7HH, 7EA, 7EH) 1.9 TDI AXB 77 (105) 1896 2003.04 - 2009.11. VW TRANSPORTER V box (7HA, 7HH, 7EA, 7EH) 1.9 TDI BRS 75 (102) 1896 2006.06 - 2009.11. VW TRANSPORTER V box (7HA, 7HH, 7EA, 7EH) 1.9 TDI BRR 62 (84) 1896 2006.01 - 2009.11. VW TRANSPORTER V flatbed / chassis 7JD, 7JE, 7JL, 7JY, 7JZ, 1.9 TDI AXC 63 (85) 1896 2003.04 - 2009.11. VW TRANSPORTER V flatbed / chassis 7JD, 7JE, 7JL, 7JY, 7JZ, 1.9 TDI AXB 77 (105) 1896 2003.04 - 2009.11. VW TRANSPORTER V flatbed / chassis 7JD, 7JE, 7JL, 7JY, 7JZ, 1.9 TDI BRS 75 (102) 1896 2006.06 - 2009.11. VW TRANSPORTER V flatbed / chassis 7JD, 7JE, 7JL, 7JY, 7JZ, 1.9 TDI BRR 62 (84) 1896 2006.01 - 2009.11. GENERALLY, ALL OUR ITEMS ARE HELD IN STOCK. NO WAITING PERIODS, IMMEDIATE DISPATCH. CUSTOMERS SHOULD SATISFY THEMSELVES THAT ANY ITEM CHOICE MADE IS SUITABLE FOR THEIR INTENDED PURPOSE OR USE. The item "4X BOSCH DIESEL INJECTOR SEAL REPAIR KIT AUDI A3 A4 VW GOLF PASSAT SHARAN 1.9TDI" is in sale since Saturday, November 30, 2013. This item is in the category "Vehicle Parts & Accessories\Car Parts\Engines & Engine Parts\Gaskets & Seals". The seller is "oe_quality_parts" and is located in BIALYSTOK. This item can be shipped worldwide.